Click HERE to PRE-ORDER our newest Oni amigurumi doll from the Yokai Collection with MEOWZABOO. Sits at 9 inches tall. Hand sculpted, cast, and painted by Wonder Goblin. Crocheted and sewn together by Meowzaboo. This is a pre-order. May take several weeks before all pieces are complete and ready to ship. You will be notified once the items are ready to ship. See more of our work from the Yokai Collection by checking out @meowzaboo on Instagram. Hand painted Jade QUEEN HAGOPUSS Chinese New Year shop drop this Thursday 2/15/18 at 9 PM Eastern time - 10 AM 上午10点 北京时间 星期五 Friday in China - 6 PM Thursday in California! Cast in soft vinyl, Hags are 9 inches tall and articulated at 9 points. Each of them are unique with subtle differences, so no two are alike. Comes bagged and tagged. Limited edition of only 10. $250 USD each plus shipping. Remjie's adorable Doro figure returns once more to the world of the Wonder Goblin as "Night Tripper". Figure created by Remjie and painted by Wonder Goblin in black light reactive vinyl paints. Each Doro comes with a crocheted removable cloak and amigurumi shroom made by Meowzaboo. Limited Edition of 7. To enter the free raffle, click the "LOTTERY OPEN" ticket at the top of the home page and complete the online form on Sunday, February 4th at 11:00 AM Eastern (8 AM PST). The 4 hour lottery ends at 3:00 PM Eastern. Only one entry per person and/or household. The winners will be drawn randomly from all entries and notified via their email with a private shop link. Lottery entries not chosen will not be notified. If chosen, payment of $300 + Shipping must be paid within 24 hours of notification. After 24 hours, winner's link will expire and be passed on to the next random winner in line. Any winner refusing to pay by set deadline will be excluded from all future lotteries. Figures will ship out USPS Priority within the week. PLEASE NOTE: My figure runs are extremely limited, and there are more collectors than there are toys, so this is the reasoning for a toy lottery. Wonder Goblin holds raffles to make it fair for everyone wishing to collect a WG piece. Shop drops are fun, but generally the ones with the fastest internet connection are the ones to snag a piece. With a lottery, everyone has the same chance percentage. All Wonder Goblin lotteries are free to enter. Only the entries selected by the random name picker will be expected to pay. Lotto this Sunday 1/21/18 at 10 pm Eastern Time. Paul Kaiju and I have teamed up to bring you 3 special Pollen Kaisers - "Maui Waui GID" on left - "Cataract" in middle - "Romulan" on right. Created by Paul Kaiju, and painted by Wonder Goblin in vinyl paints, these sofubi figures are about 13 inches tall from staff to toe. To enter the free raffle, click the "LOTTERY OPEN" ticket at the top of the home page and complete the online form on Sunday, January 21st at 10:00 PM Eastern (7 PM PST). The 1 hour lottery ends at 11:00 PM Eastern. Please specify in the form which Pollen Kaiser you would like to enter for by name - Maui Waui, Cataract, or Romulan. If any are acceptable, please write ALL in the appropriate block. Only one entry per person and/or household. The winners will be drawn randomly from all entries and notified via their email with a private shop link. Lottery entries not chosen will not be notified. If chosen, payment of $350 + Shipping must be paid within 24 hours of notification, no exceptions. PLEASE NOTE: After 24 hours, the private link will be passed on to the next random winner in line. Any winner refusing to pay by set deadline will be excluded from all future lotteries. Thanks so much for your support, and regardless of whether you're able to enter or not, I hope you all have a radical week! This is the first amigurumi doll in the Yokai Collection I'm forming with MEOWZABOO. The 48 hour lottery for Winter Marbled Oni will open on Saturday 1/13/18 at 12 Noon Eastern Time. Micro-Run of only 5 pieces. Sits at 9 inches tall. $125 Each plus shipping. Hand sculpted and cast in marbled resin by Wonder Goblin. Crocheted and sewn together by Meowzaboo. To enter the free raffle, click the "LOTTERY OPEN" ticket at the top of the home page and complete the online form on Saturday, January 13 at 12:00 PM Eastern. The 48 hour lottery ends on Monday, January 15 at 12:00 PM Eastern. Only one entry per person. The winners will be drawn randomly from all entries and notified via email with a private shop link. Entries not chosen will not be notified. If winners fail to make payment within 24 hours of being notified, they will be blacklisted from all future raffles. Please do not enter if you cannot afford to make payment in the event of winning this lottery. As always, big thanks to those participating, and don't forget to check out Meowzaboo on instagram @meowzaboo for future releases! HAPPY HOLIBLAZE! Surprise Budfoot lotto now open! This is a hand flocked One-off created from a test pull that came out perfect. Stands at 12 inches tall, painted with vinyl paints, and comes with bong accessory. $350 + shipping. I'll never paint another Budfoot in this HOLIBLAZE fashion, so hop on your SLAY and ride over to my webshop for your chance to snag this jolly stoner for CRYPTMAS! Mwahahaha, so many good puns, the Crypt Keeper would be proud of me. To enter the free raffle, click the "LOTTERY OPEN" ticket on the home page, and fill out the brief form. The randomly selected winner will be notified via email on Xmas day! Thanks and have yourself a scary little christmas! Collab with MAX TOY CO.! Kaiju Tripus was created by Max Toy Co. Sofubi made in Japan. Painted by Wonder Goblin with black light reactive urethane paint and clear coated with a candy gloss finish. Limited to only 2 pieces! To enter the free raffle, click the "LOTTERY OPEN" ticket at the top of the home page and complete the online form on Sunday, December 17th at 6:00 PM Eastern (3:00 PM PST). The 4 hour lottery ends at 10 PM Eastern. Only one entry per person and/or household. The winners will be drawn randomly from all entries and notified via email with a private shop link. Entries not chosen will not be notified. If chosen, payment of $400 plus shipping must be paid within 12 hours of notification, no exceptions. As always, thank you so much to all those participating! I am truly grateful for everyone's interest and support. Atlanta's NPR station WABE 90.1 interviewed me about my toy company for a segment on "City Lights" with Lois Reitzes. It aired live November 30, 2017, but for those that missed it, you can hear the 14 minute story above, or click this link HERE to redirect to their website to check out the story and see the accompanying write-up as well. Huge thanks to Lois Reitzes and Gabbie Watts for having me! Lunar Beast collab with Daniel Yu! Collab with Daniel Yu! The Lunar Beast was designed and sculpted by Daniel Yu, produced in soft vinyl by Unbox Industries, and hand painted by Wonder Goblin with blacklight reactive vinyl paints. Micro-run of only 4 pieces. To enter the free raffle, click the "LOTTERY OPEN" ticket at the top of the home page and complete the online form on Tuesday, November 28 at 12:00 NOON Eastern (9:00 AM PST). The 10 hour lottery ends at 10 PM Eastern time. Only one entry per person and/or household. The winners will be drawn randomly from all entries and notified via email with a private shop link. Entries not chosen will not be notified. If chosen, payment of $250 plus shipping must be paid within 3 hours of notification, no exceptions. As always, huge thanks to those participating! Collab with KENTH TOY WORKS! 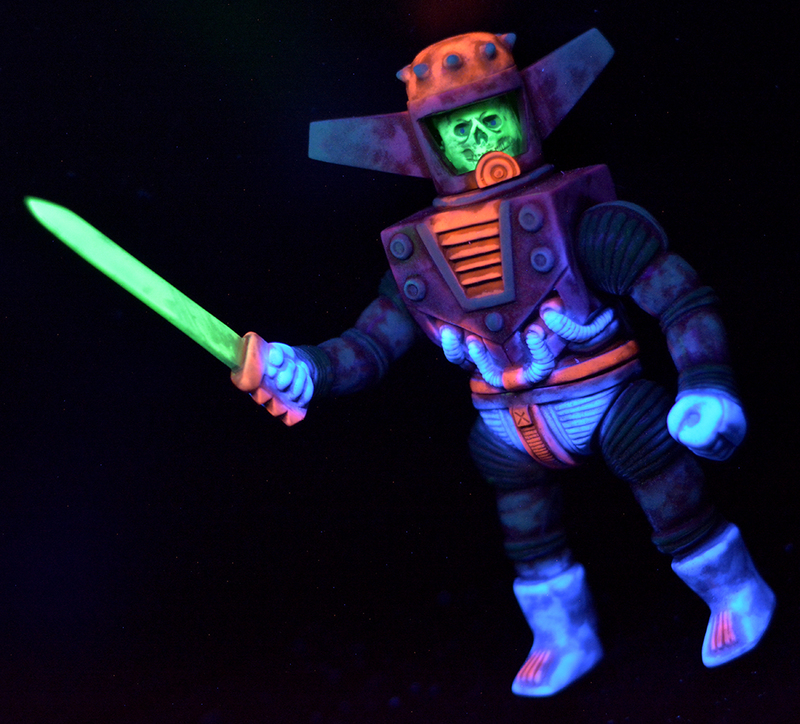 Space Knight Connell "Psychonaut" was created by Kenth Toy Works and made in Japan, painted by Wonder Goblin with black light reactive vinyl paint and lightly flocked with holographic glitter. To enter the free raffle, click the "LOTTERY OPEN" ticket at the top of the home page and complete the online form on Sunday, November 19 at 10:00 PM Eastern (7:00 PM PST). The 2 hour lottery ends at Midnight Eastern. Only one entry per person and/or household. The winners will be drawn randomly from all entries and notified via email with a private shop link. Entries not chosen will not be notified. If chosen, payment of $250 plus shipping must be paid within 10 hours of notification, no exceptions. Big thanks to those participating! Check out the video below of the toys in action! The Queen Hagopuss painted colorway "Taffytits" Pre-Order, is now LIVE. Lavender soft vinyl painted with vinyl paints. 9 inches tall, with 9 points of articulation. Only ONE per person/household please. $200 each plus shipping. She comes bagged and tagged with header art. Pre-orders will be ready to ship out in time for this Xmas. This will be the last big Hagopuss run of the year! Click HERE to shop! Queen Hagopuss "Spooklejuice" is limited to only 3 pieces. There will be 1 additional "Mutant" variant also available (depicted at bottom). Cast in GID soft vinyl, and airbrushed by yours truly with black light reactive vinyl paint. Hags are 10 inches tall and articulated at 9 points. Each comes bagged and tagged with a Baby Hagopuss hand-cast in resin, and is hand signed on the bottom. To enter the free raffle, click the "LOTTERY OPEN" ticket at the top of the home page and complete the online form on Sunday, October 8th 6:00 PM Eastern (3:00 PM PST). The 1 hour lottery ends at 7:00 PM Eastern. Only one entry per person and/or household. The winners will be drawn randomly from all entries and notified via their PayPal Email with an invoice. Lottery entries not chosen will NOT be notified. If chosen for the "Standard Spooklejuice" Hag, payment of $265 (Includes U.S. shipping) must be paid within 4 hours of notification, no exceptions. For International shipping add $50. If chosen for the one-off "Mutant Spooklejuice" Hag (depicted below), payment of $300 (Includes U.S. shipping) must be paid within 4 hours of notification, no exceptions. For International shipping add $50. Meowzamoth amigurumi collab with Meowzaboo! It's the 2 year anniversary of the Wonder Goblin Toy Company, and to celebrate, I'm getting back to my roots! In the beginning, I worked very closely with the talented and lovely Nala Katze making handmade resin figures. Since then, Nala has gone on to open her own company, MEOWZABOO where she creates psychedelic amigurumi creatures. We've decided to mesh our styles in order to create a new line of amigurumi resin dolls we present as the WONDERBOO COLLECTION! The Wonderboo Collection's first release consists of 5 one-of-a-kind "Meowzamoths", all different sizes and colors, and easily able to be displayed on the wall. The Meowzamoth faces were hand cast and painted by yours truly, and the rest of the entire body was all carefully crocheted one stitch at a time by Nala. These devilish adorables are available in her webshop at Meowzaboo.com. They took nearly 3 months to create, so needless to say, these are special works of art. The time is finally upon us. I've taken the big leap into the world of soft vinyl, and I'm super excited to start this journey off with none other than the feared and revered QUEEN HAGOPUSS! Due to the awesome amount of feedback and requests I've received for her over the past few months, I've decided to give everyone the opportunity to take her home by making this first run an open pre-order lasting for only 72 hours, starting Monday 6/12/17 at 6 pm EST. Cast in glow-in-the-dark soft vinyl, this blank figure stands at approximately 10 inches tall, is articulated at 9 points, and comes bagged and tagged with header art painted by yours truly. 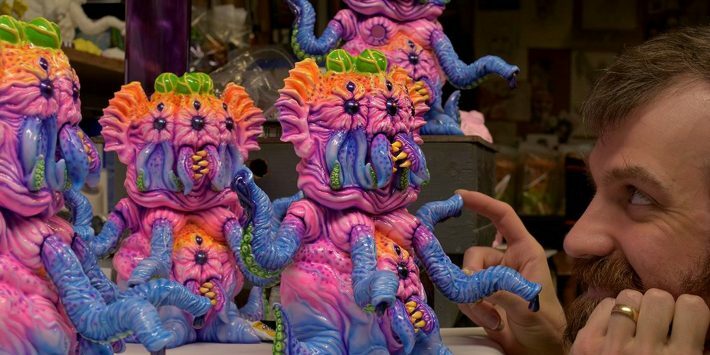 Queen Hagopuss will be $140 plus shipping, and the first 10 orders will receive a free GID Baby Hagopuss hand-cast in resin! Pre-orders should take between 3 to 6 weeks to fill. Click HERE to check her out. We've got some epic exclusives coming to Designer Con this November! Click HERE to check out the write-up from SpankyStokes.com to get all the details. Skinner and Wonder Goblin present FUNGOID MAN! SKINNER and WONDER GOBLIN have joined cosmic forces in order to breathe life into this primal alien fungus of a sinister god. Pre-Order for two different colorways this Friday the 6th - "Grape Jungle" Fungoid at 12 Noon EST, and "Lilac Blank" Fungoid at 3 PM EST. This is a pre-order shop drop (Friday 6th at 12 noon EST). Due to the large size and intense paint job, it could take close to a month to have these ready for shipping. The Silent creature was formed in the damp cavernous kingdom miles below any toiling civilization of transient evolution. The communal whispers of eukaryotic things that grow with the phosphorescent will of an ill minded fungus speak of the sweet desire of skin and bones. Without predators and without reason, the fungoid man begins his ascent to usurp the flesh of every living thing. Will the taste of your shrieking body be a distant event hidden deep within the collective memory of a Fungoid Man? The pile of armor and steel ephemera will be the only thing left of you, there on the floor of the water worn cavern you once explored. You have been broken down into trace elements and absorbed into the poison thing that walks silently below the earth. The Fungoid Man is forever there in the dark, finding its way. Inspired by my favorite Godzilla film "Godzilla vs. Hedorah", these baby kaiju sit at 2 inches long, are cast in high quality urethane resin, and painted with monster kolor paints. Choose from the dark green Deep Sea variant, or the multi-colored Purp Inferno. All Baby Hedorahs come packaged in a plastic egg. Also available are Baby Hedorah Mystery Eggs. Click HERE to shop. 7 color silk screen print of the Manbeast monster from my feature film "The Demon's Rook". Printed with black light responsive inks! Limited edition of 100, and hand signed and numbered. Click the image above to purchase. They come to Earth. They come in love. They come to abduct our hearts! Standing at 4 inches tall, these glow-in-the-dark handpainted Spacelings hold authentic Swarovski crystals in their lovable grasp. Be creative this Valentine's, and gift yourself or your heart throb something besides the usual fleeting box of chocolates. This cutie will last forever... seeing as you don't turn 'em over to the government. Limited edition of only 25. Unpainted Super Glow Spacelings are also available, limited to 25. Click HERE to shop!